My computer generates random stuff. Here’s why. I order my computers to generate works of art for me. Either on a daily basis, or on demand, whenever a human needs some. I never work for robots, robots work for me. I started this project because I don’t understand why some things are beautiful and others aren’t. That’s why I order the computer to always generate something else. Why is a certain colour combination nice? Why are others ugly? I’ve read about colour theory, but still I don’t really get it. I can not pick two colours and know beforehand that the combination will be incredible. So I ordered my server to generate 100 rectangles of random size and random colour on a background of random colour. I scroll through that page whenever I need a colour combination. I know some designers who use it as a tool. Whenever I scroll through that page I’m surprised. I see combinations I would never have picked that work perfectly well together. I ordered my computer to teach me. That’s the way it should be. Nobody will ever see the exact same rectangle that I see. Even the images that are generated on a daily basis, images that never change, will look different for everybody who looks at it. An image is small on a telephone screen. It’s big on a desktop screen. It’s bright on a high quality screen, and the colours are dull on my eight year old, tired Macbook. All images are grey on a Kindle. The image looks different when I’m outside in the sun, or when I take a look at it at night, in bed. And my friends who are colourblind will see a completely different image altogether. I wrote a script that orders my computer to translate colours to human sentences. An unsaturated green rectangle — not wide at all and very high — on a very unsaturated, dark magenta background. People who lost their eyesight can now imagine what the image looks like. They too will see a completely different image from what everybody else sees. Possibly the most beautiful thing ever imagined. These rectangles are the simplest things my computer generates for me. Mathematically it can generate billions and billions of different rectangles. The colour notation I use is called HSL, which defines a colour by setting the values of the hue, the saturation and the lightness. There are 360 hues, while saturation and lightness both use a scale of 1 to 100. This results in 360x100x100 = 3.600.000 possible colours. The rectangles are generated by defining two values: the x and the y position of the left top corner. These can be between 10 and 490, so my computer can generate 829.440.000.000 different rectangles. This is already a number most humans can not really understand. But the fact that humans look at them, on devices, in an environment, adds quite a few extra layers of randomness to these works. I’ve always been envious of people who can draw. Especially people who can draw organic shapes that look good. I can draw rectangles. And triangles, and circles if I try hard. I don’t understand blobs. So I ordered my computer to generate blobs for me. I want to understand why some blobs look good while others are ugly. Again, I created a page that generates 100 blobs of random shape and random colour on a background with a random colour. And again I created a page that generates one single image of a blob of random shape and random colour on a background with a random colour every day. There are several ways to follow the updates of the Daily Blob. You can visit the website every day on your preferred device. The shape of the blob will adapt itself to the dimensions of your screen: the image is always as wide and as high as your browser window. This means that I will see a different shape on my phone in portrait mode than someone who’s looking at the same thing on their laptop. People can receive updates through a Twitter stream as well. They receive a link to the image, but they don’t really need to follow the link: you can simply look at the profile image of the twitter account. It’s updated every day. Nobody will see the exact same form because it’s rendered differently on different devices. If you really want to you can order prints, or books of all these works my computer generates. You can order big and small books, hard or soft cover, or in the form of a magazine. You can order posters, prints on canvas, on aluminium, even professional grade aluminium prints if you really want to. You can even choose the size of these prints. These are options my print service of choice offers. I have no control over the printing process. All prints will be slightly different. But even if they weren’t, they do all look different. The shape and size of a print on a small wall will be perceived differently than the shape and size of that exact same print on a huge wall. People might see different things in these blobs, like a Rorschach test. While I’m not really interested in how these works are perceived psychologically, it is interesting from a huge number perspective. It definitely does add even more layers of randomness to the images. For instance, the fact that a work is generated on a certain date might add value to it for some. It might be a terrible work for others. The rectangles and blobs are positioned at random on the canvas. There are a few limitations to the position. For instance, I always want the background to be visible and I don’t want blobs to extend outside of the canvas. But apart from these simple rules there’s no real logic. There’s no logical relationship between the size of the canvas and the size of the blob. If there’s a mathematical relationship it’s purely by chance. I read an article by Nathan Ford about the classic excellent orthogons that were described by Jan Tschichold. After reading it I wanted to know what these ratios look like. I could imagine that a ratio based on the Trion, which is 1:1.154, is less dramatic than the golden ratio of 1:1.618. But I couldn’t see it exactly. 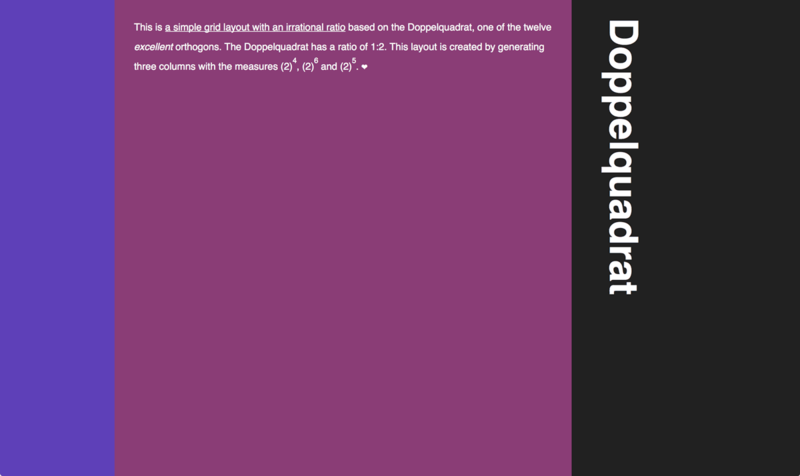 So I ordered my computer to generate 100 random three column layouts, all based on one of the twelve excellent orthogons. The colour scheme is generated at random, and more often than not they don’t really match. But all ratios always look fantastic. Some are functional but a bit boring, some are more powerful, others are extremely dramatic. They may not fit every purpose, but they’re always right in some way. These mathematics seem to work. The interesting thing about layouts based on ratios is that they always stay the same. While the whole image is completely different on different screen sizes it’s still the same ratio. When you stretch a rectangle, or squash a blob, they look different. The image really changes. Ratios don’t change. Each canvas has a ratio. Screens often have a ratio of 16:9. Some papers have a 3:4 ratio. Browser windows have an endless amount of different ratios. Layouts with a certain ratio will look better on some canvasses. There is probably some mathematical function that explains relationship, but I’d like to be able to see it, as if I were a talented visual artist. So I order my computer to generate all kinds of ratios for me. Maybe one day, after looking at thousands of different ratios, I will understand how they work. I wanted to know what it looks like if a blob morphs into a rectangle. So I ordered my computer to generate 100 random blobs that turn into a rectangle as big as the canvas in ten equal steps. This is not an animation, it’s one single image which shows all ten steps. In the first few experiments the steps were equal. I simply divided the difference between two points by ten. It looks nice, but it never amazes. It turns out the excellent orthogons are a way to make these steps much more interesting to look at. Even a tiny ratio like the Biauron (1:1.236) will result in a much more powerful image. Huge ratios like the Hecton (1:1.732) can be stunning. Of course these blobs don’t only change form, they also change colour. There are several ways to change colour, according to a computer, and the results are quite different. The first thing I tried, because it’s easy to do, is to use opacity. Each next step is a little bit more transparent. It looks a bit like mixing paint. Another way to change colour is to use the Red, Green and Yellow colour channels. You simply define the difference between both colours and divide the result by ten. Pretty simple math, even I was able to write that function. The result is almost the same as using opacity. I used this same method for the HSL colour function. The result is much more dramatic. Moving from one hue to another can result in rainbow-like effects. When the colour of the blob is similar to the colour of the background the ten steps can simply become invisible. This is no problem when generating individual works of art, it’s part of working with random numbers. It was a problem thought while I was testing the code. So I decided to add a white stroke around each form. This was the first time during this whole process of creating works of art that I really thought I had created something beautiful. It turns out a black stroke can be wonderful as well. Just like no stroke. I added these three variables to this mix of extreme randomness. One of last steps I took was slicing things up. In this last version of the works I ordered the computer to show only a part of each image. Either one of four quarts, or one of the four middle sixths of the image. I sliced things up after I saw what Karl Gerstner did with his mathematical graphic works. Showing parts of the image adds one extra layer of randomness, but it also focuses on the essence of the work. These slices are the minimum that’s needed to give an answer to these questions: what does colour look like, what do shapes look like, and what do ratios look like. While all these images are static, there’s always the factor time involved. My very first experiment with generating random images, Amor Vacui, generates white images with dimensions based on the last four digits of the Unix Time stamp. The books and prints of this project do not use a specific time stamp, but they are all generated on a certain time. And flipping through the pages of a book, or scrolling along a long page with different shapes both involve time. The images themselves stay static though. Tijmen Schep asked me if I could optimise these works for his web gallery. In order to fit within the frame of web art in his gallery, my works should animate. So I created an animated version of the last two works. This time I did’t order the computer to generate 100 works below each other, on a long web page. I told it to generate them in a long animation, which is very similar, code wise. So instead of scrolling to the next blob that turns into a rectangle you just wait until the computer has finished morphing. The hardest part of creating an animation like this one is deciding how long it should take to finish. I decided 24 hours is a nice starting point. At first I ordered the computer to animate between 100 different shapes in 24 hours but I adjusted this to 200. If you look closely you’ll see the shapes animating. It’s slow enough to be invisible if you don’t pay attention though. I think this is a desired effect. If you look at the work a few times during the day you’ll see a different work. I created another version that morphs between 52 shapes in a year. And another one that morphs between 100 shapes in a century. You’d expect these animations to need almost zero computing power, but alas. Computers don’t think like humans. That’s why I try to never work for them. After I created these animations I wondered: Did I create a screensaver? It does look like one, but if I understand screens correctly these animations are screen destroyers. And it doesn’t really matter. In the end this project helped me understand a bit more about beauty. About organic shapes, about ratios, about what works. It didn’t give me a deep understanding of why certain combinations work and others don’t, but it gave me the confidence to create things with colour. And I do know what different ratios look like. I could, if I wanted to, use this knowledge to create different kinds of designs. I would now know what to do if a project needs a bombastic, confident look, or if a project needs a subtle, friendly, inviting feel. It took me a day to write this essay. During this time my server generated five books and four prints. In a week there will be 63 more works. And as long as I pay the bills for my server this will go on. And nobody gets tired. Below you’ll find a few lists with links to all the individual works. Every time you visit one of these pages 100 new forms are generated. You can scroll the page to see all of them. I created a few slow animation where blobs morph into other blobs. They are similar to the 100 things series, but instead of scrolling, they slowly morph. Every day my server generates a few books with 100 pages each. They can be ordered as a magazine print, as a softcover book, or as a hardcover book. Most of them are available in A4 or in the smaller A5 format. Every day my server generates a few files that can be bought as a print. There are quite a few possible formats. You can order a poster, or a print on canvas, or a so called dibond, which is a print on aluminium (which looks beautiful). You can also choose to print them on a high quality gallery print (which I haven’t seen yet). Sizes of these prints range from 300x300mm to 1×1 meter. Bigger sizes are possible, but you should contact me if you want one. There’s much more. For those of you who feel like clicking and getting lost for a while, all my experiments are collected over here. I thoroughly enjoyed this post Vasilis! Thanks for taking the time to write about your experiments. I especially enjoy your ‘I never work for robots, robots work for me’ stance at the root of it all. Now carry on and order your computer to teach you some new things about beauty! Thank you for you kind words, Arno. And don’t worry, my computer keeps teaching me things about beauty every day. Around nine o’clock, fifteen minutes after you wrote this nice comment, my server generated three new prints and two new books.